Here is the word from the JMarr site, but I suppose things have changed since this? Last edited by elko on Wed Jan 04, 2006 5:23 pm, edited 1 time in total. <!--QuoteBegin-Grim O'Grady+Jan 3 2006, 03:41 AM--></div><table border='0' align='center' width='95%' cellpadding='3' cellspacing='1'><tr><td>QUOTE (Grim O'Grady @ Jan 3 2006, 03:41 AM)</td></tr><tr><td id='QUOTE'><!--QuoteEBegin--> I thought it had been discussed somewhere on this forum, anyhoo GU & I have our tickets sorted so we'll see you there. Anyone else from here get there tickets? 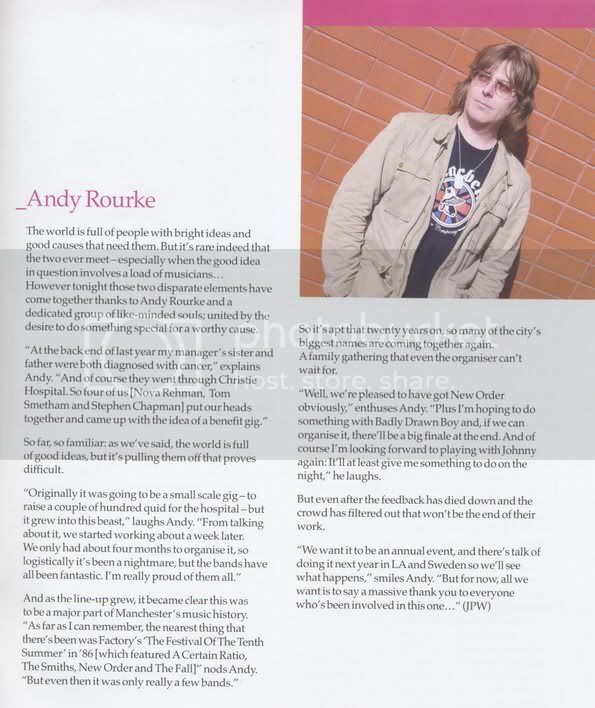 It ought to be relocated to the Andy Rourke thread tbh has he's the main bloke behind it all, any speculation has to what songs they will play? There is a light must be a cert? Lucky you, Grim and GU! 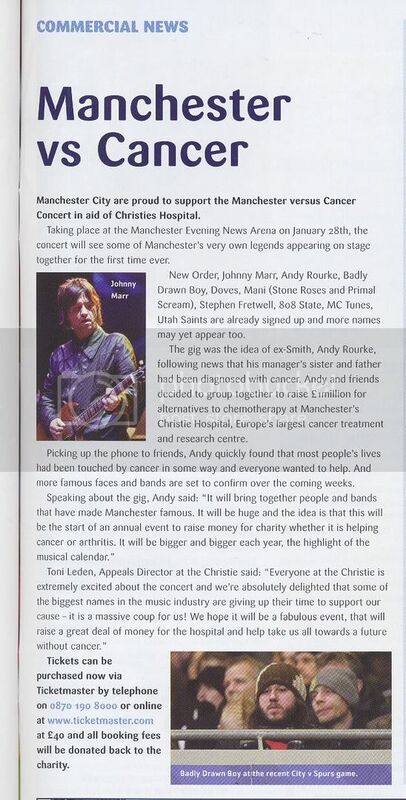 this was in yesterdays City (v man u) programme. well the time is nearly upon us, we are travelling by train 10.30am tomorrow (Saturday), get's us into Manchester by 3.30pm (ffs). I'll let you know how it goes, Monday. Grim and Lynne, have a wonderfully terrific time tomorrow! I hope the concert gets some good press and reviews. Have a safe journey and be sure to post a detailed account of the concert and trip! Last edited by Still Ill on Sat Jan 28, 2006 4:39 am, edited 1 time in total. well we've just got back from a thrilling weekender! Johnny started his Healers set with 'There Is A Light...' & then got Andy up for their final song 'How Soon Is Now? ', last time I went to see the Healers & heard Johnny sing I thought to stick to what you do best Johnny but last night he was on song (so to speak). The whole event was magic & when it comes out on dvd it's got to be a must for all concerned. Met up with a whole bunch of Smiths fans, new & old. Even Morrissey the 23rd being left on the train (in the toilet) & ending up in Peterboro' was a laugh, he eventually caught us up in Manchester 3 hours after we got there, numbtie! I'll shove the pics etc up in the next day or so. Off to lie down now. this is Johnny & Badly Drawn Boy (I think? ), they flashed up on the big screen text ROCK to some 5 digit number & for ÃƒÆ’Ã†â€™ÃƒÂ¢Ã¢â€šÂ¬Ã…Â¡ÃƒÆ’Ã¢â‚¬Å¡Ãƒâ€šÃ‚Â£1.50 you'll get photo's from Mick Rock of tonights bands. So I did & this was my ÃƒÆ’Ã†â€™ÃƒÂ¢Ã¢â€šÂ¬Ã…Â¡ÃƒÆ’Ã¢â‚¬Å¡Ãƒâ€šÃ‚Â£1.50's worth. 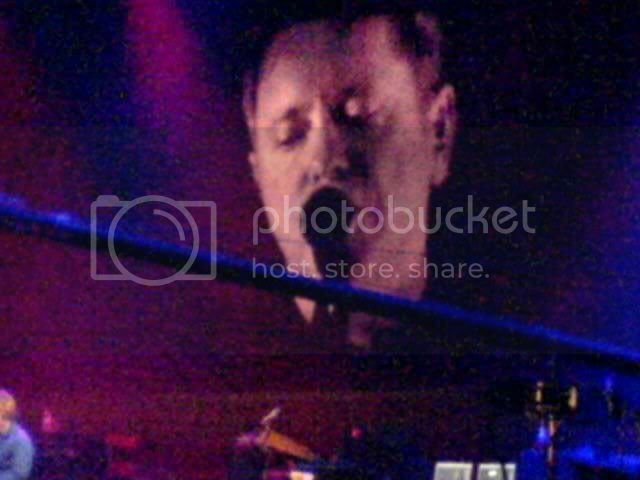 New Order being Joy Division, it looks like something from Big Brother (& I'm talking about Geo Orwell's 1984 - not some sad tv show btw). 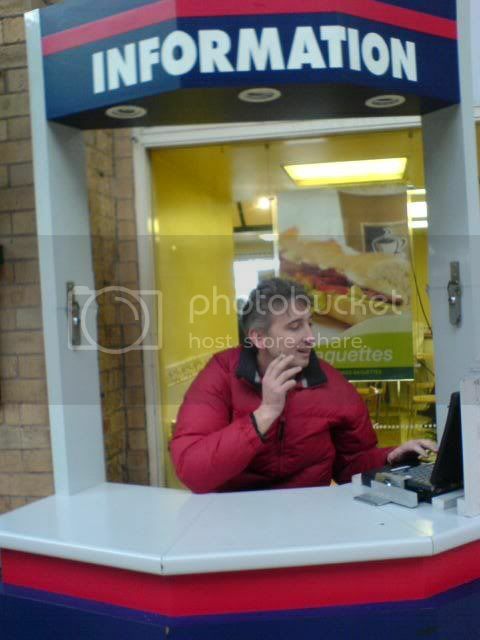 this is the man who want to the toilet on the train just before arriving at York train station & didn't get off to get the connection over to Manchester, he detoured via Peterborough & therefore took 3 hours longer to get to Manchester <!--emo&:D--> <!--endemo--> . This was taken on our way home awaiting the connection from York back to Edinburgh. Just watching my filming, we was sat way to close to the speakers the sound is extremely bass heavy & booming to distortion my wee camera mic obviously couldn't handle it very well & somehow I managed to hit the pause button 1/2 way thru recording 'There Is A Light...' but I realised & hit the record again so there's a jump in the middle, the picture is shakey too because everyone went mad dancing & bouncing about! I got caught filming 1/2 way thru 'How Soon Is Now?' 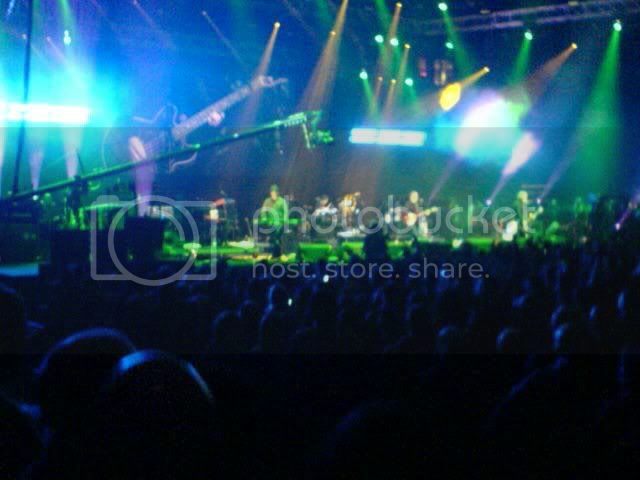 that he played with Andy Rourke, I didn't stop recording though I just put the camera down until the security bloke had gone away so the pic goes off a bit too, heehee! He kept coming back to me later on in the gig (because I was continuing to film other bits & he finally said if I see you filming again I'll confiscate the camera, so I switched off) & danced off most of the alky. If any of the images off the dvd are any good I'll stick 'em up here. I've stuck 'em in Johnny's section because it's mostly him! Last edited by Grim O'Grady on Mon Jan 30, 2006 3:25 pm, edited 1 time in total. this is the transcript of how he introduces Andy before they play 'How Soon Is Now?'. kinda too long really innit? 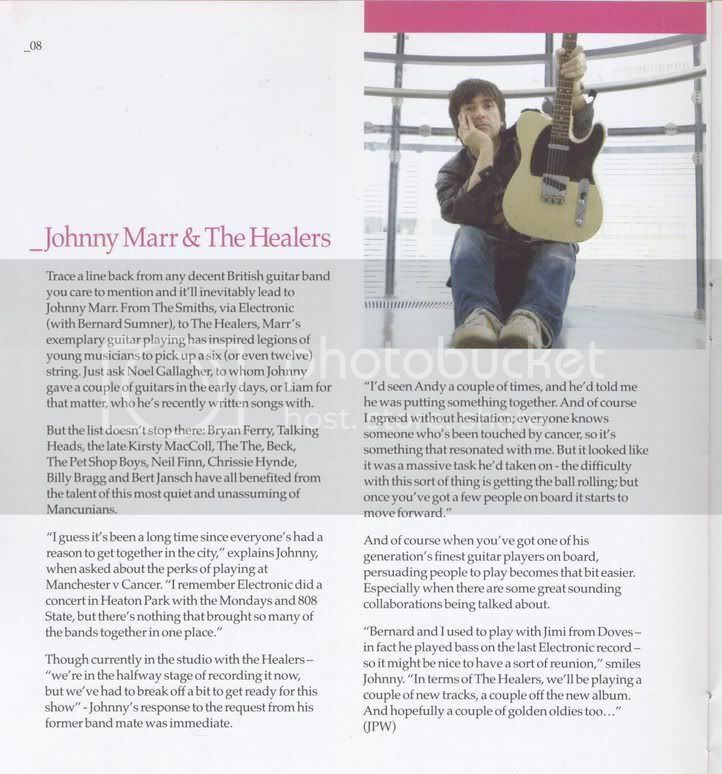 also here's the programme scans, Johnny was page 8 & Andy was page 9. Thanks for the pics. I love the program scans! Was that a picture of Morrisseythe23rd I'd read about on the other side. The one who got lost? Yes, the one pic is very '1984', funny comment there. I downloaded from a link at solo, the short video where Johnny introduces Andy and a few seconds of HSIN. Anyone else seen it? Grim, sounds like you had a cracking good time!! I have a funny vision of you and your camera trying to compete with the night's events. Not an easy thing to do, I bet, trying to capture the sights and sounds. Everyone who gets to see your footage thanks you, I'm sure! I forgot to add: Your thoughts on the Healers? Didn't realize you'd seen them. Do you remember what 'old' songs of theirs they played? Last edited by Still Ill on Mon Jan 30, 2006 7:27 pm, edited 1 time in total. I've posted Johnny's intro to Andy on Gmail. It's an mpg.